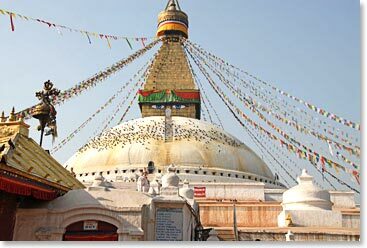 Everest Base Camp Trek Spring 2013: What Makes It Special? This spring marks both the 60th anniversary of the first ascent of Mount Everest, as well as the 50th anniversary of the first American ascent. It will be an exciting time in Everest’s Khumbu region and we welcome you to join us in the celebration! In April 2013, Berg Adventures alumni will attempt to summit Mt. Everest for themselves. YOU have the opportunity to trek with the team to Everest Base Camp where you will spend two nights enjoying the camaraderie as the team prepares for their ascent to the top of the world. What else makes our Spring 2013 Everest Base Camp Trek so special? Trekking with a Berg Adventures Mount Everest climbing team is not inherently different from our other Base Camp treks; we follow the same trails, see the same remarkable scenery, stay at the same welcoming tea lodges and eat the same delicious home-cooked meals. What makes this trip different is that you get to experience the trek through the eyes of an Everest climber. 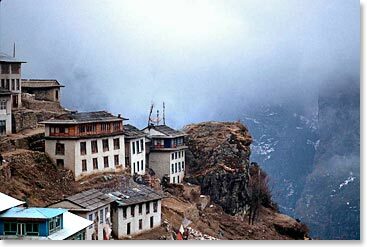 From the moment you land at the Lukla Airport, you will feel the excitement of the season upon you. The air is palpable with the feeling of anticipation and all hopeful eyes are cast upon the summit of the great Chomolungma. You will see the signs of expedition preparation at every turn: endless trains of yaks carrying climbing gear and supplies, teams of climbers gathered around maps, lamas offering blessings and locals offering well wishes, and the transformation of Everest Base Camp from a pile of moraine into a bustling city of tents. Spending two nights camping at Everest Base Camp with the team will be an unforgettable experience that will give you one final glimpse into the life of an Everest climber. At camp you will get to see the challenges that the team faces as you stare up at the dramatic wall of the Khumbu Ice Fall, watch the snow blowing off of Mount Everest’s summit and feel the cool morning air before the sun reaches camp. With a bit of luck, you may find yourself at Base Camp for the traditional Buddhist ceremony called the pooja. 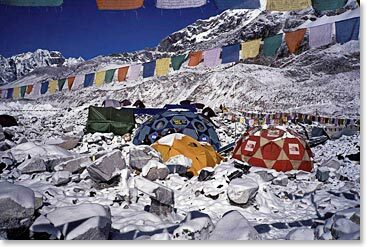 Not until the pooja has been performed can the team proceed into the Khumbu Icefall. On this trip you will receive all of the benefits of a Berg Adventures trek – excellent guides and support staff, a private team cook serving three hot, fresh meals and at least one snack per day, cozy nights in welcoming lodges and a level of service that will make you wish that everyday could be a Berg Adventures Day! Register for the Everest Expedition Support Trek today!